Gold bug Byron King claims that there is yet another reason that gold might be a reasonable investment: declining production. 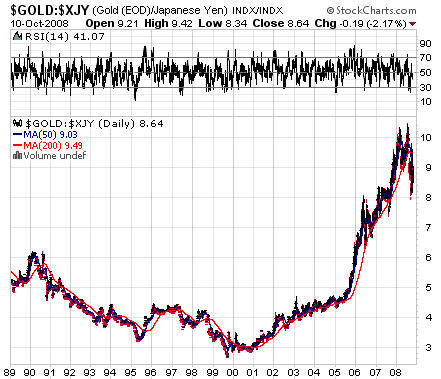 Because we're in a world that appears to have encountered peak gold as well as peak oil. 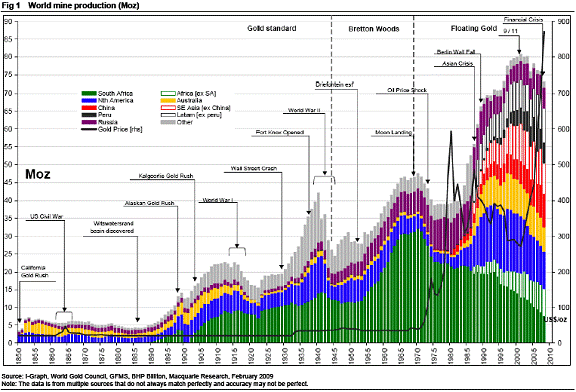 If you look at historical production, worldwide gold output reached a top right around the year 2000–2001. Overall output has declined and we're not replacing output from the big mines of the past. Despite discoveries here and there, miners have to dig deeper and deeper into the reserves. In a big mining country such as South Africa, for example, some of the deepest mines now are at 4,000 meters. That's 13,000 feet. Yes, it turns out he might be. I know that there have been warnings about peak oil since at least the 1970's. Top experts now say peak oil is real. See this, this and this. But I am not an expert on oil or gold. Two former Moody's executives, in testimony at a House Oversight and Government Reform Committee hearing, said workers were encouraged to remain silent and cover up evidence of alleged improper practices in assigning and monitoring credit ratings. Two former Moody's executives -- Scott McCleskey and Eric Kolchinsky -- testified that senior managers were willing to silence employees who raised concerns about the ratings process or compliance efforts. McCleskey said that while he was the head of compliance at Moody's, he voiced concerns that the firm was not properly monitoring ratings on municipal debt. McCleskey, who was dismissed by Moody's in 2008, said he was instructed not to mention the issue in e-mails or writing. Kolchinsky, a Moody's managing director who was recently suspended by the firm, said senior managers pushed revenue over ratings quality and were willing to fire employees who disagreed. The congressional testimony can be read in full here. Previously, I've pointed out that employees of the big 3 ratings agencies admitted that they had sold their soul for higher fees, that the rating agencies took "bribes" for higher ratings, and that Moody's argued in court that anyone who believed its ratings was an idiot. The ratings companies also admitted that they didn't fire the analysts who gave AIG and Bear Stearns AA or higher ratings up until the moment they went bankrupt. Rep. Edolphus Towns, the Democratic chairman of the panel ... also said his committee would investigate why the Securities and Exchange Commission failed to act on a March 2009 letter sent by Moody's former senior vice president of compliance. The executive urged the SEC to take a closer look at Moody's weak compliance department and ratings process. Credit Default Swaps - Love 'Em, Ban 'Em, or Tax 'Em? I have repeatedly argued that over-the-counter credit default swaps (CDS) - or at least at least "naked" CDS - should be banned ("naked CDS" is the term I coined to describe the situation where the buyer is not the referenced entity. I will not comment on whether or not there is a real economic benefit when the referenced company buys CDS concerning itself or its suppliers as an insurance policy; I will leave that analysis to the CDS experts). Newsweek called CDS "The Monster that Ate Wall Street"
In perhaps the most anti-derivatives statement of all, Nassim Nicholas Taleb said this month, "To curb volatility in financial markets some financial products 'should not trade,' including complex derivatives." But CDS seller are now saying everything is fine, that they are making changes which reduce risk, and that the danger has passed. A year after the bankruptcy of Lehman Brothers Holdings Inc., credit-default swaps have lost their stigma for disaster. So are CDS really safe now? Well, initially, before we can even begin to have an intelligent discussion about this issue, it is important to note that - according to Satyajit Das, a leading credit default swap expert - the commonly-accepted figures for the CDS losses suffered due to Lehman's bankruptcy have been understated. He also says that the justifications for the value of CDS for the economy are phony. And it is also important to acknowledge that the government's proposed regulations of CDS (if they ever pass) won't really fix the problem. Indeed, Das says that the new credit default swap regulations not only won't help stabilize the economy, they might actually help to destabilize it. And it should be remembered that the overwhelming majority of derivatives are held by just 5 banks. So the people behind the effort to reassure everyone that CDS are safe again are the too big to fail banks, desperate to restart the toxic asset and exotic instrument gravy train. And the big financial firms and the government are both desperate to increase leverage, rather than allowing the deleveraging play out. See this, this, this, this and this. CDS are an important way of creating leverage (for example, last year, the market for credit default swaps was larger than the entire world economy). So there is a huge (although wrong-headed, in my opinion) incentive to underplay the risks of CDS. It is also possible to argue (although I haven't seen this argument validated by any experts) that CDS are inherently destabilizing for the financial system since they increase interconnectivity. And don't forget that credit default swap counterparties drive company after company into bankruptcy, and that - once a company the counterparties are betting against goes bankrupt - the counterparties cut in line in front of all of the bankruptcy creditors to get paid (and see this and this). In other words, there are other problems caused by CDS other than destabilizing the economy as a whole. Two of the most interesting proposals in dealing with CDS come from Paul Volcker and Yves Smith. Volcker argues that banks which receive taxpayer bailouts should not be heavily exposed to derivatives trading. Yves Smith says that the best approach would be to significantly tax credit default swaps. She argues that that would shrink the CDS market - and the associated risks - faster than anything else. The more I think about it, the more Smith's approach makes sense. Perhaps most importantly, CDS sellers - like the big sellers of other financial products - know that the government will bail them out if CDS crash again. So they have strong incentives to sell them and to recreate huge levels of leverage. Indeed, the same dynamic that led to the S&L crisis also led to last year's CDS crisis, and will lead to the next crisis as well. So - while CDS might be a particularly dangerous type of "weapon of mass destruction" (in Buffet's words) - the financial looters will probably find some way to loot on the public's dime, no matter what happens to CDS, unless they are they are meaningfully reigned in (or broken up). In other words, the bottom line is that - yes - CDS are still dangerous. But - just as a killer, unless restrained, could use a paper weight to kill - the too-big-to-fails would just use some other instrument even if naked over-the-counter CDS are banned or tamed. Taking away a convicted murderer's gun might be a good first step. But if he is still free to cause harm, he may very well kill again. Simon Johnson: "Barack Obama, Like Louis XIV Before Him, Knows Exactly What is Going On"
Many people assume that Obama doesn't understand that his economic team - Summers, Geithner, Bernanke, Gensler and the boys - are preserving the status quo, and failing to make the fundamental reforms needed to stabilize the economy. But professor of economics and former chief IMF economist Simon Johnson isn't buying it. During the reign of Louis XIV, when the common people complained of some oppressive government policy, they would say, "If only the king knew . . . ." Occasionally people will make similar statements about Barack Obama, blaming the policies they don't like on his lieutenants. If Obama doesn't institute fundamental reforms now, Simon will blame him - and not just his advisors or the the lobbyists. This essay rounds up arguments for gold as a reasonable investment. Commentators such as Ambrose Evans-Pritchard and Byron King argue that China's hunger for gold will put a floor on gold prices. Specifically, they argue that China will "buy the dips" in gold prices, effectively putting a minimum on how low gold prices can go. Note 1: Zero Hedge alleges that newly-declassified federal documents prove that gold prices have been manipulated for decades. If these documents are authentic (I have no reason to doubt their authenticity, but have no inside knowledge), if the claims of artificial price suppression are true, if this is widely publicized, if such publicity causes someone like Congressmen Alan Grayson, Brad Sherman, Ron Paul, or Dennis Kucinich to raise a ruckus in Congress, and if Congress as a whole votes to ban such a practice, then the price of gold would presumably rise. That's a lot of ifs. Note 2: Some of the best recent arguments I've heard against investing in gold are written by Vitaliy Katsenelson. Read this, this, this and this. Many smart people have said that credit default swaps destabilize the financial system. See this and this. But there is yet another reason - one perhaps even more fundamental - why CDS are inherently destabilizing to our economy. Remember, one of the reasons that AIG, Goldman Sachs, JP Morgan, and Bank of America have been labeled "too big to fail" is that they are highly interconnected. In other words, mainstream economists believe that their interconnectivity means that a failure of any one of them could bring down the whole system. For example, Paul Volcker told Congress last week that the approach proposed by the Treasury is to designate in advance financial institutions "whose size, leverage, and interconnection could pose a threat to financial stability if it failed." Systems expert Valdis Krebs points out (as does Frontline) that the higher the interconnectivity of financial institutions, the more vulnerable the financial system. Stephen G. Cecchetti - Economic Adviser and Head of the Monetary and Economic Department for the Bank for International Settlements - agrees that interconnectivity is one of the factors which leads to financial instability. Derivatives drove the boom before 2008 by encouraging banks to make loans without adequate reserves. They also worsened the panic last fall because they inherently tie institutions together. Investors worried that the collapse of one bank would lead to big losses at others. CDS tie the financial giants together with each other, with smaller banks, with other types of financial institutions, and with national, state and local governments. They therefore inherently destabilize the financial system. To curb volatility in financial markets some financial products “should not trade,” including complex derivatives ... While products such as options are acceptable, he still doesn’t understand some derivatives after 21 years in the industry. Taleb joins George Soros and many others who have called for banning credit default swaps. Paul Volcker and others have said that banks which receive taxpayer bailouts should not be heavily exposed to derivatives trading. But Yves Smith says that the best approach would be to tax credit default swaps. She argues that that would shrink the CDS market - and the associated risks - faster than anything else. This is in line with criticism of the Fed of BIS and many independent economists and financial experts. As I have recently pointed out, there are strong arguments for ongoing deflation. But even deflationists think that - after a period of deflation - we might eventually get inflation. For example, in October, I guessed 1 1/2 to 2 years of deflation, followed by inflation. Moreover, noted deflationist Martin Weiss - after predicting for 27 years straight that we'll have deflation - has now changed his mind, and thinks inflation is a greater short-term threat than deflation. For these two reasons - and to make clear that the inflation versus deflation debate is complicated and includes many factors - this essay will focus on the arguments for inflation. Faber said he thinks - in the medium-term - we could have high levels of inflation (and see this and this). Faber's argument is that a weakening dollar will lead to inflation (as every dollar will buy less goods and services). The government has injected trillions of dollars into the economy in the form of TARP bailout funds and other programs. Indeed, the government’s own watchdog over the TARP program - the special inspector general - said that number could be $23 trillion dollars in a worst-case scenario. The basic argument for inflation is - as everyone knows - that the government has injected so much money into the economy (through bailouts, quantitative easing, purchase of treasuries, etc.) that there will be a lot more dollars chasing the same number of goods and services, which will drive up prices. In other words, the supply is the same, but demand has increased. Indeed, the U.S. has also provided huge sums of dollars to foreign central banks. Could dollars given abroad cause inflation inside the U.S.? Yes - because some proportion of those dollars will be spent by citizens in those countries to buy stocks, commodities, goods and services within the U.S. Specifically, billionaire investor Jim Rogers said we are facing an "inflationary holocaust". The back-of-the-envelope figures I've seen bandied about say no. Because of the massive destruction of credit (which - as Mish has repeatedly pointed out - must be included in discussions of inflation versus deflation), the government would probably have to print one-and-a-half to two times as much as it already has in order to create inflation. The government could still do so. Yes, it would be suicidal for the dollar and might cause foreign buyers of U.S. treasuries to stop buying, but the boys in Washington could - if they were crazy enough - increase the money printing and quantitative easing to the point where inflation actually kicks in. Will they do so? Summers, Geithner and Bernanke have proven themselves willing to do a lot of crazy things over the past year, so I wouldn't rule the possibility out altogether. Indeed, when the Option Arm, Alt-A and commercial real estate mortgages start defaulting in earnest, there will be a lot of pressure on Washington to "do something". But again, doubling the amount of money printing would turn the dollar into monopoly money, and so there will be a lot of pressure not to turn America into Zimbabwe. Many commentators also argue that the U.S. is intentionally devaluing the dollar in order to increase trade. And - as everyone knows - the dollar might tank even if the boys don't intentionally devalue it into oblivion. Just look at the amount of printing and easing which has already been done, the tidal wave of debt overhang, and the lack of fundamental soundness in the giant banks, the financial system, and the U.S. economy as a whole. Moreover, some people argue that the dollar carry trade will drive inflation. Specifically, they argue that we'll get "spec-flation", meaning that investors will buy dollars and - in a carry trade - use the dollars to invest abroad. This will devalue the dollar, creating inflation. And, importantly, the U.S. is quickly losing its status as the world's reserve currency. Therefore, the "premium" on the value of the dollar for its status as reserve currency will also fade, and the value of the dollar decline. For these and other reasons, Faber and other inflationists would argue that the dollar will continue to substantially decline and inflation will therefore kick in (Note: Mish is still a dollar bull, and so doesn't concede this point). I have previously argued that the rising tide of unemployment will contribute to deflation for some time. However, Edmond Phelps - who won the Nobel Prize for Economics in 2006 - and PIMCO Chief Executive Officer Mohamed El-Erian both say that the "natural unemployment rate" has risen from 5 to perhaps 7 percent. What is the natural unemployment rate? It just means that if unemployment falls below that a certain percentage, then inflation will be created. So if the natural unemployment rate has risen, that may mean that we will get inflation sooner (when unemployment falls to 7%, instead of when it falls all the way back to the previous peg of 5%). End of Foreign Bond Purchases? If the Chinese and Japanese stop buying our bonds, we could easily see [inflation] go to 15 to 20 percent,” he said. “It's not a question of the economy. It's a question of who will lend us the money if they don't. Imagine us getting ourselves in a situation where we're totally dependent on those two countries. It's crazy. Finally, Andy Xie argues that "bottlenecks" can cause inflation. Specifically, Xie argues that inflation in a single key market - say oil - can cause inflation, even in a weak economy. As I have argued for a year, we will probably have a period of deflation followed by inflation. I still believe that. When inflation will kick in is the million dollar question. The inflation camp argues that inflation will kick in any second now without any warning. In the deflation camp, David Rosenberg argues for years of deflation, and Dr. Lacy Hunt argues for decades of deflation. Bottom line: In my opinion, the question is when, not if. But in investing, being too early is being wrong. Someone who is positioned for inflation decades too early will get creamed. Likewise, someone who is betting on deflation for 20 years will get hurt if inflation kicks in next month. Note: Remember that we could also get mixed-flation. In other words, inflation in some asset classes and deflation in others. Indeed, given that speculators drove up the price of oil last year, it is possible that - especially in a stagnant economy - speculators could drive up the prices of some asset classes and drive others down. The House Committee on Financial Services has just posted the video of Barney Frank's opening statement on the bill to audit the fed (HR 1207). Frank provided some very interesting history in his opening statement. Specifically, Frank says that Ron Paul originally introduced the bill for the first time in 1983. But for 12 years after that, the Republicans used their control of the Finance Committee to insure that there was "no time" to give Paul's bill a hearing. In 2003, when Paul was in line to become chair of the domestic monetary subcommittee, that subcommittee - coincidentally enough - immediately disappeared, and was merged into another subcommittee in order to shield the Federal Reserve from the imminent oversight which a monetary subcommittee under Paul would presumably create. Frank makes clear that it is not one party or the other responsible for suppressing Paul's audit-the-fed bill for 25 plus years. As Frank put it, there was "bipartisan ignoring of the issue". This is an historic hearing. The Gentleman from Texas, Mr. Paul, filed this bill for the first time in 1983. There then ensued a number of things including 12 years in which the Republican Party controlled the agenda of this committee and found no time for this hearing. So I am very pleased, in this show of bipartisanship, to have been the one to have given this important piece of legislation its first hearing ever. Indeed, and I think this history is relevant, because we (mumbles at 0:38) partisan issue. The first time this committee, in my experience – having come here in 1981, engaged with the Federal Reserve, and I think it was true of the ‘70s and ‘60s as well, but the first time this committee dealt with the questions of openness and transparency of the Federal Reserve was under the leadership of the great chairman who is pictured over my right shoulder – Henry B. Gonzalez. In fact, a former chief economist of this committee, Robert Auerbach, has written a book, and I get no share of the proceeds, but it was: [Something] and Deception at the Fed. It was a description of the efforts by Mr. Gonzalez, ultimately successful, to compel the Federal Reserve to be more open. It’s astonishing to me to remember that when I first came here the decisions of the Open Market Committee were never announced. Now, how you influence interest rates by concealing from the market what you decide to do is very odd. What it shows is that the penchant for secrecy outweighed the desire to be effective; because it clearly could not have been as effective to have a secret directive to the markets, which of course got leaked and distorted, etc. There were minutes that had been taken at the Federal Reserve meetings. The Federal Reserve at the time – 1983, denied in the later 80s when Mr. Gonzalez became chairman, they denied that there had been minutes. They were later ‘found in a drawer.’ There were not reports released. So this is not a new thing for this committee. There was an effort to open it up and there was significant increased opening. The other point that is relevant, and I do want to say to make sure that this is not a partisan issue, is [facts on the record] in 2003 the gentleman from Texas, Mr. Paul was in line in seniority to be chairman of the Domestic Monetary Policy Subcommittee. That subcommittee immediately disappeared. It was merged into the International Monetary Policy Subcommittee because there were people who were trying to shield the Federal Reserve from Mr. Paul’s influence. Two years later, when they could not merge that subcommittee further into the Housing Subcommittee (although they probably thought about it), a member of this committee, with some seniority, who had not previously taken the subcommittee chairmanship - Congressman was persuaded to come over and do this. So this is the first time this bill was filed, and despite a bipartisan ignoring of the issue, and this is the first time that we have had had the hearing and we are serious about some legislation in this regard. I will say that I have a couple of concerns. The Federal Reserve engages in considerable market activity – they buy and sell. I do believe that it is important to note, that in our society that that be made public. We don’t want public entities buying and selling securities with nobody else ever knowing. I also believe, however, that there needs to be some time to elapse so that their buying and selling does not have a direct market effect. [Some time so] that other people can’t ride on it. So that’s one area where I will be working with the gentleman from Texas, and we’ve discussed it. We want there to be publicity, we don’t want there to be a market effect in the near term. We don’t want people trading with the Fed or against the Fed, etc. As to monetary policy: I think it’s also clear that we don’t want…I believe, and have exercised that right for some time, to comment on monetary policy…the notion that no elected official should ever comment on something so important as monetary policy is profoundly anti-democratic. I believe that we should continue to do that, and that’s something I’ve been doing since I got here. We don’t want to give the rest of the world, or more importantly, domestic investors the impression that we are somehow, in a formal way, injecting Congress into the setting of monetary policy. Because I think that could have a very destabilizing effect. I don’t think that will be hard to do without in any other way interfering with other functions. But, how the Federal Reserve carries out what it is doing, its buying and selling (what it buys and sells), all those, given its importance, can entirely and legitimately be made open. And I will say this – there were predictions. One of the things that the media fails to do…the media rarely passes up a chance to refute those of us who are in office, but they get bored too easily. There are often predictions of doom whenever people in Congress propose to do something. Very often those predictions of doom go unrealized and there is too little checking. I urge people, if you are interested in this, go back to some of the predictions that were made in the late 80s, when under the leadership of Henry Gonzalez…when the Fed was not being legislated but pressured to make some changes, read about the predictions of doom and note that none of them came to pass. I believe that we are similarly able in a wholly responsible way, without in any way be interfering in the independence of the monetary policy setting function or with the integrity of the markets, to go forward with completing the job. And, I would say, completing the job that really did begin with Henry Gonzalez – but completing it, and a lot needs to be done. The gentleman from Texas has been in the lead in pushing for that. [He has been] making sure that this important part of our federal government is subjected to the same rules of openness that every other element in a democratic government should be. How well has the Federal Reserve performed for America? Mainstream pundits, of course, say that Bernanke has saved the world . . . . but they said the same thing about Greenspan. So let's look at the actual historical record to determine how well the Fed has done. Jane D'Arista, a reform-minded economist and retired professor with a deep conceptual understanding of money and credit [has a] devastating critique of the central bank. The Federal Reserve, she explains, has failed in its most essential function: to serve as the balance wheel that keeps economic cycles from going too far. It is supposed to be a moderating force in American capitalism on the upside and on the downside, the role popularly described as "leaning against the wind." By applying its leverage on the available supply of credit, the Fed can slow down a boom that is dangerously overwrought or, likewise, stimulate the economy if it is sinking into recession. The Fed's job, a former chairman once joked, is "to take away the punch bowl just when the party gets going." Economists know this function as "counter-cyclical policy." Remember also that Greenspan acted as one of the main supporters of derivatives (including credit default swaps) between the late 1990's and the present (and see this). (2) claims that the Federal Reserve System saddles the U.S. government and American people with trillions of dollars in unnecessary debt (that would not be incurred if the government took back the "power to coin money" granted to the government itself in the Constitution). I am agnostic about Elliot Wave stock charting. But, as I see it, there are two basic views of those who follow Elliot Wave. On the one hand, Mish and McHugh think we might be on the verge of a major wave c down crash. Basically, a second major leg down in the stock market, just like the second leg down of the Great Depression. On the other hand, in various recent interviews, Marc Faber - who also follows Elliot Wave - believes that (with some corrections along the way) the market will go up for the next 3-4 years. He then believes the entire capitalist system will crash, but that's another story. So will we get a major wave C down crash in the near future, like Mish and McHugh think will probably happen? In 3-4 years, as Faber thinks will happen? I don't know. But I think the spectrum of opinion from smart people is fascinating. As everyone knows, the big banks have gotten bigger and bigger. Noted economist Mark Zandi says we have an oligopoly of banks, and that "the oligopoly has tightened". I think we may be in a far more dangerous place today than we were a year ago. Economists and other financial experts could provide many reasons why concentration is dangerous. Certainly, their very size distorts the markets and limits the growth of smaller banks. and the economy cannot fundamentally recover while the giants continue to drag our economy down the drain. But I would like to use an analogy from science to discuss why our current, highly-concentrated banking lineup presents a huge threat to our economy (analogies can sometimes be useful; e.g. Taleb talks about black swans). It has been accepted science for decades that when all the farmers in a certain region grow the same strain of the same crop - called "monoculture" - the crops become much more susceptible. Because any bug (insect or germ) which happens to like that particular strain could take out the whole crop on pretty much all of the region's farms. For example, one type of grasshopper - called "differential grasshoppers" - loves corn. If everyone grows the same strain of corn in a town in the midwest, and differential grasshoppers are anywhere nearby, they may come and wipe out the entire town's crops (that's why monoculture crops require such high levels of pesticides). On the other hand, if farmers grow a lot of different types of crops ("polyculture") , then a pest might get some crops, but the rest will survive. I believe that the same principle applies to our financial system. If power and deposits are concentrated in a handful of mega-banks, problems with those banks could bring down the whole system. As Zandi noted, there is an oligopoly in the banking industry (and "the oligopoly has tightened"). Moreover, the mega-banks are huge holders of derivatives, including credit default swaps. JP Morgan Chase, Bank of America, Goldman Sachs, Citigroup, and Morgan Stanley together hold 80% of the country's derivatives risk, and 96% of the exposure to credit derivatives. Even though JP, B of A, Goldman and Citi are separate corporations, they are so interlinked and intertwined through their derivatives holdings that an attack by a "pest" which swarmed in on their derivatives could take down this "monoculture" of overly-leveraged, securitized, derivatives-heavy banking. So that's it. They are square, then. Of course unless the sellers of their protection default. If they do, then it may very well cause a daisy chain reaction that could get very ugly ... If you thought Lehman caused problems, compare Lehman's counterparty exposure to JPM's. The bottom line is that our current banking monoculture threatens not only the biggest banks, but the entire financial system. Pesticides become less effective as pests develop resistance - and, as a byproduct, we poison friendly critters. Likewise, the giants "creatively" work their way around regulations so that the regulations are no longer effective (or at least not enforced, and regulatory capture is widespread. And too much regulation stifles productivity,as an unintended byproduct. Having power and deposits spread out among more, smaller banks would greatly increase the stability of the financial system. And having more power and deposits in banks using a wider variety of business models (e.g. among banks that aren't heavily invested in derivatives and securitized assets) will create a banking "polyculture" which will lead to a much more stable financial system. In other words, if we decentralize power and deposits and increase the variety of banking models, we will have a healthier financial system, we won't have such an urgent need to try to micromanage every aspect of the banking system through regulation,and the regulations we do have will be more effective. By the way, I would argue that that is one of the reasons why Glass-Steagall was so important: it enforced diversity - depository institutions on the one hand, and investment banks on the other. When Glass-Steagall was revoked and the giants started doing both types of banking, it was like a single crop cannibalizing another crop and becoming a new super-organism. Instead of having diversity, you've now got a monoculture of the new super-crop, suscecptible to being wiped out by a pest. The kinds of things which threaten depository institutions are not necessarily the same type of things which threaten investment banks, hedge funds, etc. The above is yet another reason we should break up the giant banks using antitrust or other laws. Note: Wells Fargo's derivatives holdings are substantial, but much less than the other big boys. But rumors are that Wells might be in real trouble as well due to its commercial real estate and other portfolios.